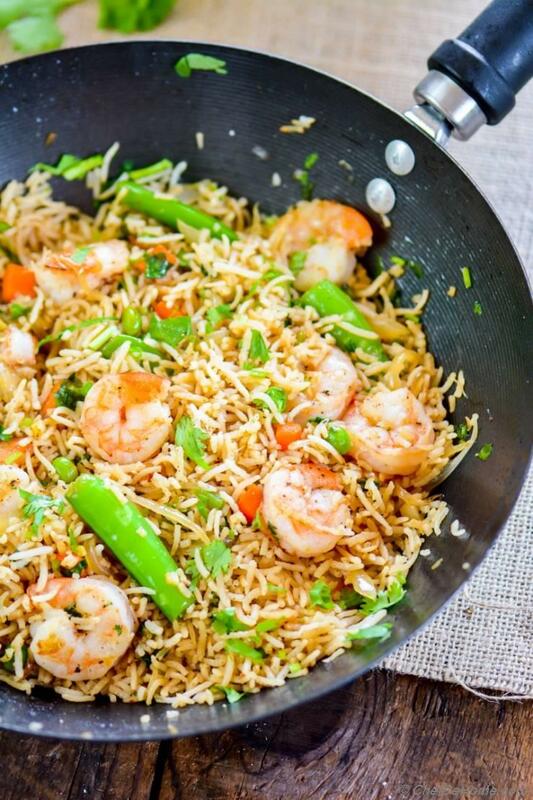 Shrimp Fried Rice - Lean Protein, lots of veggies, and cooking time under 20 minutes! What not to like for dinner? 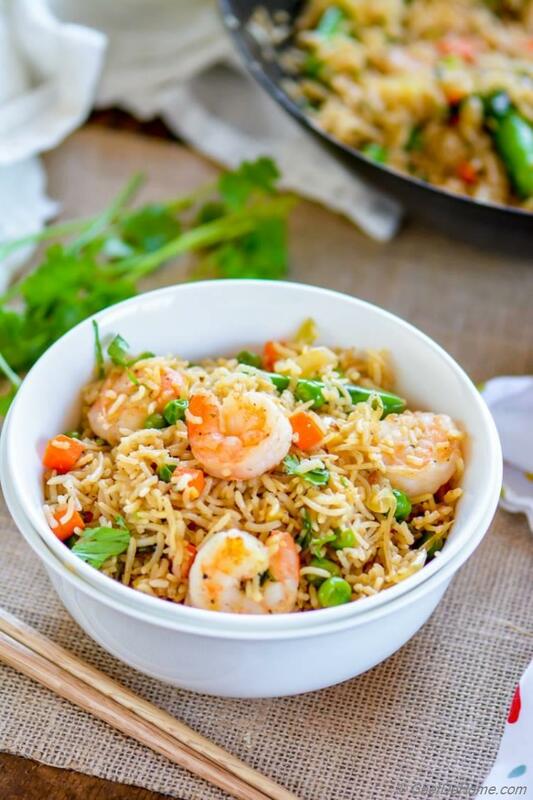 Spicy Shrimp Fried Rice loaded with vegetables and fried with Asian seasonings for the best homemade one-pot fried rice dinner ever! 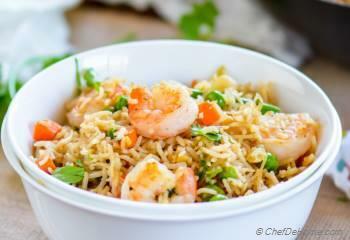 Just 15 minutes start to finish.. Shrimp fried rice are my favorite ditch-the-delivery dinner on busy weekdays. 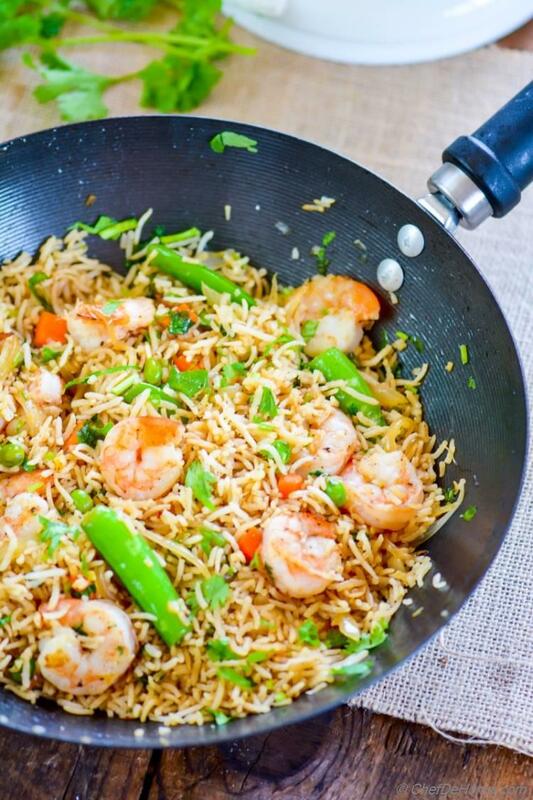 A batch of cooked rice, shrimp, veggies, and spices get magic-bath in wok and turn into a scrumptious meal. My favorite part? Kitchen smells like - waiting for order in Asian Restaurant!! Recently we visited an authentic Thai place near-by. Gosh they sell so good Tofu Soup. Everyone was just crazy for it.. including me.. no kidding. And names of dishes were so authentic that we did not know what to order. lol!! Since we moved from San Diego to Orange, we often miss our favorite food joints near that area. Now, San Diego is 1 hours drive. So it has become an occasional thing. After relocating, I started making a lot of my favorite dishes there at home and Shrimp Fried Rice are one of them. I start by getting all ingredients ready for the fried rice. Asian or Indian cuisine, anything which needs more than one ingredients, I always take out and measure everything in advance. Specially, these fried rice.... they transform from rice to "fried rice" so so quickly that round-trip to pantry to get spices is big no-no. I start by heating oil and sesame oil in pan, until they reach smoking point... really really hot. This will cook every thing fast yet not mushy but delicious crisp tender. You know like we get in Asian eateries?! Everything piping hot, cooked yet crisp and crunchy. yummy! It is very important to season the shrimp before it goes into pan. 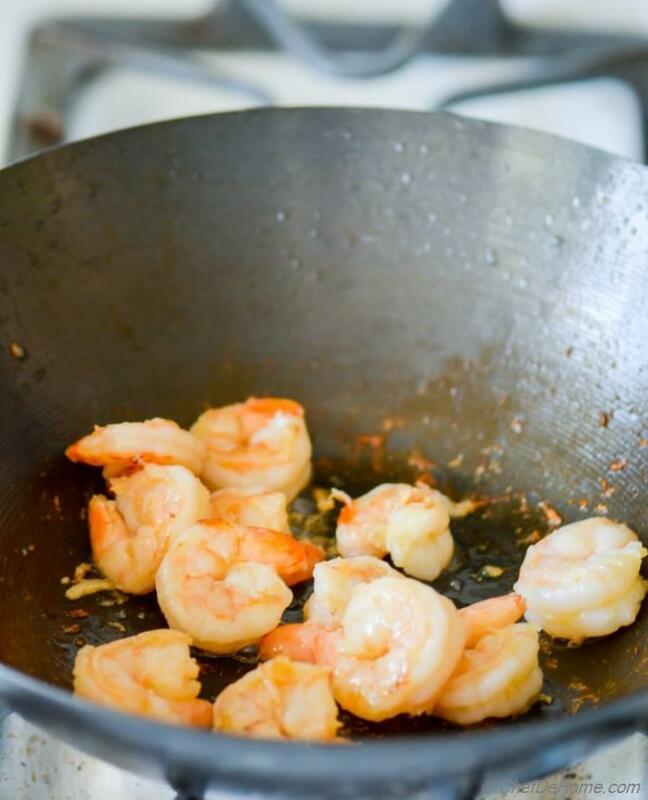 In such hot oil, shrimp will not take more than 4-5 minutes to cook. I watch it closely. Just when it is curled and pink from all sides.......Shrimp is ready to take out. The best thing I like about Shrimp fried rice or fried rice in general is that I can throw any vegetables of my choice. Like today I picked snap peas, green peas, bell peppers and onion. This veggie medley keeps changing depending upon fresh produce in my fridge. Just after shrimp is ready, I add the veggies and lots of garlic and ginger. Honestly, chunky garlic and ginger make these rice worth-every-bite for me. You can say, I'm addicted to it. The moment, rice goes in, fried rice are ready in next 2 minutes. How quick is that! Looove it. Secret to Best Fried Rice, Everytime!! Now, secret to making perfect fried rice is in just right cooked and moisture-dried rice. Trust me, mushy rice are always an epic failure in fired rice. 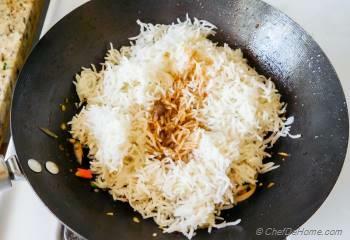 To dry-out moisture, I either spread the rice on a wide plate for 15-20 minutes or cook'em a night in advance. In short, a day-old leftover rice are THE BEST friends of Fried Rice. 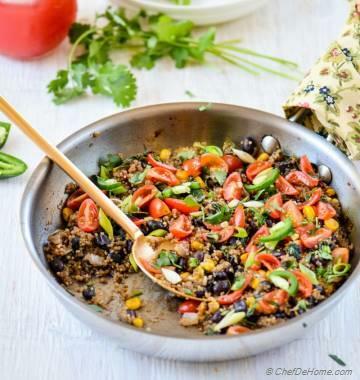 Since there is no moisture- oil, veggies, soy sauce, and other seasoning do not make rice soggy and flavor every grain. 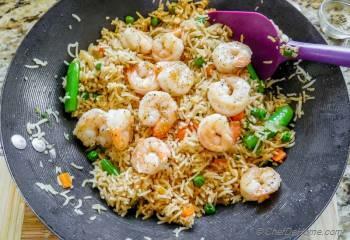 Then, in hands of expert... even simple veggies, shrimp and plain old rice turn into a best fried rice dinner ever!! Shrimp is the one seafood product that I always have frozen in refrigerator. And let me share with you best way to thaw frozen shrimp. 1) Just take is out of freezer and put in refrigerator in the morning. By evening, shrimp will thaw and still will not go bad or smell nasty. 2) If you have an unpredictable schedule or just are lazy like I'm (always), just submerge the pack of shrimp (don't remove from package) in lukewarm water for 20 minutes. 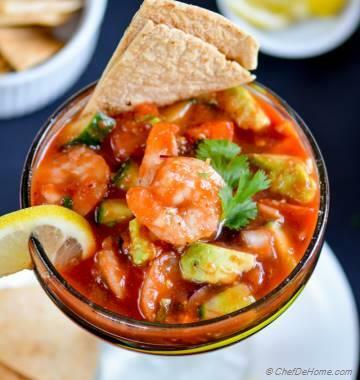 By the time you prep for dinner and set the dinner table, shrimp will be ready to go. 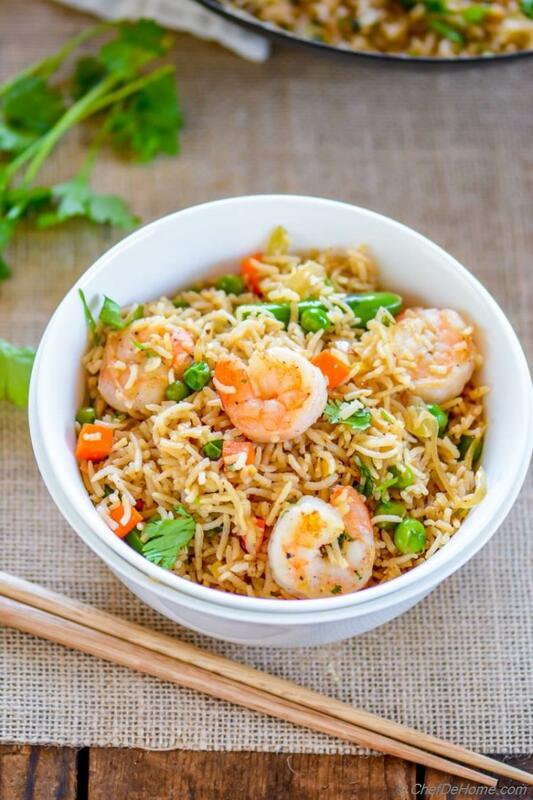 So have you all tools.... get ready to be an expert at cooking fried rice, thaw some Shrimp and serve a scrumptious Fried Rice dinner tonight. Love Rice? How about these scrumptious recipes? Total Time 15 minutes Prep Time 5 minutes Cook Time 10 minutes Difficulty Easy Yields 3-4 Cups Fried Rice Serves 3 Notes No. of servings depends on serving size. 1. 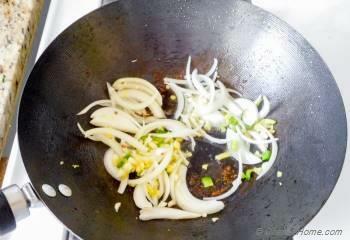 Heat 1 tablespoon of canola oil in a wide non-stick pan or a wok. Season shrimp with generous pinch of salt. 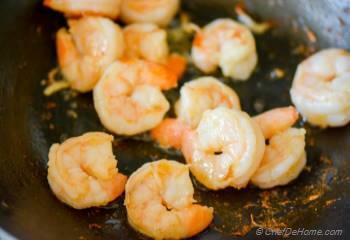 When oil is hot, add shrimp and cook for 3-4 minutes or until shrimp curls and turns bright orange. Remove in plate and set aside. If using egg, ad after cooking veggies. 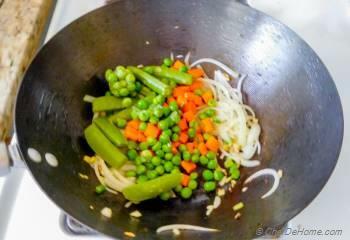 Push veggies to side, add egg and cook until scrambled and no trace of liquid remains. 5. Add in sauteed shrimp and chopped fresh cilantro. Toss until everything heated through. 6. Remove from heat. Serve while still hot and enjoy! 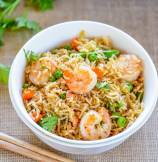 I often skip egg in Shrimp Fried Rice just for personal preference. If you like eggs, add 1 or 2 while frying vegetables, it adds good flavor to the fried rice. We always order fried rice in Thai restaurants. 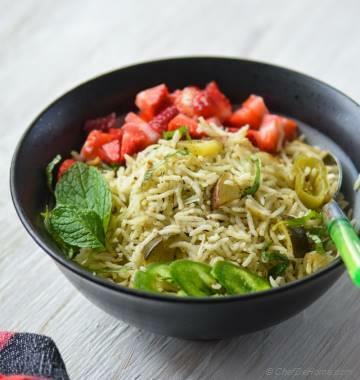 This looks good recipe to make at home.